Apex Credit Management is a rapidly growing credit management company based in Stratford upon Avon. Established in 2000 as a specialist UK based consumer debt collection agency, Apex is focused exclusively upon providing credit management services to the financial services sector. Since its inception, Apex has built up a solid client base on a foundation of ethical debt collection combined with a reputation for superior performance, quality and service. One of Apex’s corporate objectives is to provide exceptional service in terms of quality, technology and innovation. To achieve this goal, the business decided to move from manual dialling to select the Contact Centre Suite from Noble Systems. To build a business from a standing start IDL needed to touch as many prospective customers as possible. As a complement to traditional advertising and marketing adopting predictive dialler technology was central to the customer acquisition process. IDL deployed a rostrvm Voice over IP dialler infrastructure. “We recognised the current and future benefits of Voice over IP and the open SIP protocol in particular. rostrvm lets us mix and match normal telephony with Voice over IP. Constraints have been removed and costs reduced; we can expand and contract the operation and our call centre agents can be anywhere,” commented Gissinger. Res-Q is a leading outsourced contact centre providing telemarketing and sales solutions to their clients. They specialise in implementing, managing and delivering a totally outsourced contact centre operation. Through the implementation of the Noble CCS solution, they are able to offer their clients the full range of inbound, outbound and blended customer contact solutions. at the touch of a button. IVR (interactive voice response) also offers flexible self-service and call-routing options. Call Blending enables Res-Q to gain maximum efficiency from their agents by automatically controlling the flow of inbound and outbound calls. Having worked with and experienced considerable downtime with other contact centre software providers, Res-Q was particularly impressed with the robustness of the Noble platform and has had minimal downtime. Sheffield-based VOICE was set up in 2006 as an outsourced telemarketing operation, with a mission to provide clients with an outbound and inbound business-to-business and business-to-consumer solution. Their agents’ talk time has increased dramatically. They have attracted a range of clients including large blue-chip companies. They have gained reporting with detailed statistics from all campaigns in real time and historically. They have been able to provide transparency to clients and consumers for all campaigns. significant benefits to its outbound service. Through its implementation of the latest outbound call centre technology, one of Turkey’s largest companies in the call centre industry, Interactive Intelligence’s Customer Management Centre (CMC), has increased its outbound capacity by 300%. In addition, the wait times between calls decreased from 25-30 seconds to 6-10 seconds, agent productivity increased from 70% to 83%, the average sale rate per agent increased by 120% and the average call duration per sale improved by 45%. infoUK has purchased an all-in-one IP communications software suite from Interactive Intelligence. The company selected the software, called Customer Interaction Center (CIC), because of its fast implementation speeds, outbound dialling capabilities, and to enable the company to manage its two sites in London and Manchester as one virtual contact centre. Due to its software-based interface, CIC is able to connect multi-site operations using a single platform solution. This will allow infoUK to improve its workforce performance and customer service levels. CIC is able to balance interaction loads and optimise resources between the two locations while presence management allows researchers to view co-workers’ status regardless of their location. “We are creating one of the most in-depth and accurate databases of business information available. In order to do this, our team of over 70 researchers are in the process of contacting over three million UK businesses to gather and verify data that we hold. The key to selecting a contact centre solution for us was to ensure that the solution offered flexibility, was quick to implement and would enable us to run our two locations as one seamless virtual contact centre,” explains Richard Lloyd, general manager of infoUK. infoUK will be looking to add CIC technology to its sales team later in the year. As a new business infoUK selected CIC following a competitive pitch which included Aspect and SPSS among other products. AA Warranty was founded in 2007 as a telemarketing operation of Motorway Direct, the UK’s fastest growing provider of warranty products to the motor industry. They had previously outsourced their telemarketing but felt they could facilitate greater control by bringing the function in-house. 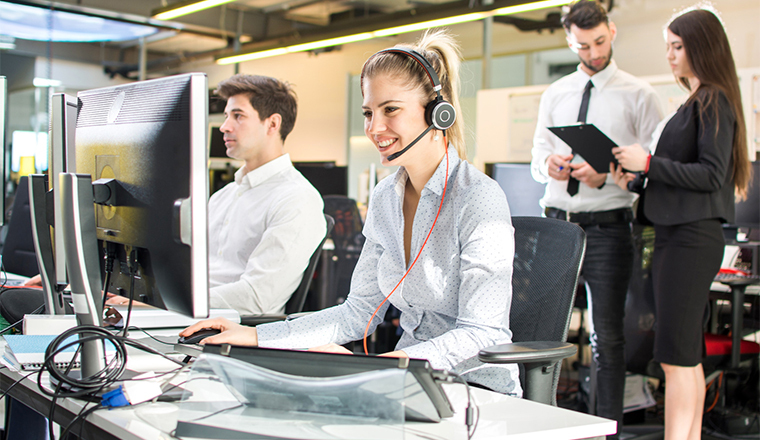 TouchStar implemented the fully compliant TouchStar Connect blended call centre system complete with ACD & IVR, intelligent scripting, call recording and reporting at AA Warranty. AA Warranty increased their operation to 30 agents soon after the initial installation. They are already planning to use the blended capability of the system to integrate inbound customer service elements of the business into TouchStar Connect. Axis Telecom was founded in 2001 as an independent telecoms service provider with the aim to bring high quality solutions and competitively priced services to business and residential customers across the UK. Their manual dialling system was not generating the efficiencies required and a competitive advantage could not be attained. Axis required a system that could operate in Power and Preview mode. This is because business selling often needs to be slower paced due to the technicalities of some products and services being explained and is less reliant on volume to generate higher levels of sales. Regal Fish is the largest direct supplier of fish and seafood products in the UK. They had not been able to use ‘predictive’ mode on their previous dialler, as it was far too easy to drop calls on the old system and they were not prepared to take that chance. They took the Ofcom regulations very seriously and did not wish to drop a single call as they could potentially lose one of their customers. Their agents’ talk time has increased considerably. Increased customer satisfaction obtained from not dropping any calls. A system that fully complies with and exceeds all Ofcom’s regulations. The ability to report with detailed statistics from all campaigns in real time has made management of the call centre operations more focused.